I found them near the entrance of Blackburrow in Queynos Hills. Some r found up north near a lake up the hills. They r hard to find and i founded two near the Blackburrow. There r mayb other locations as well. 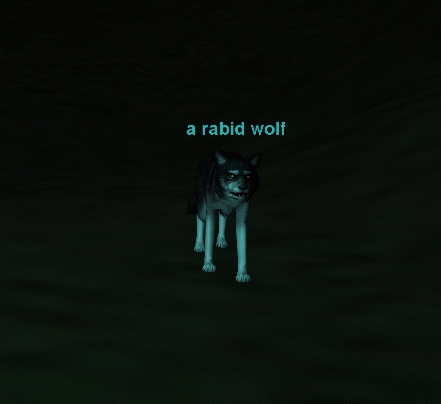 i haven't seen an rabid wolfs. can someone plz tell me where they spawn? I would like to know too. I have used a ranger I have to track them, while killing everything else in the zone including corrupt guards. Anyone have any info on place keepers, or how to make them spawn??? Can I solo it?, and if not, why not?? RE: Where have all the Rabid Wolves gone? Anyways, they seem to be part of the spawn group with the other wolves, the bears, the snakes, the beetles, and the rats. Kill any non-human wanderer in the zone and they'll eventually spawn. Also, the guards are constantly killing this category of MOB, so just checking back every once in a while works, too. Is there anyway I can get it to spawn(placeholder, etc.)? i reacently killed a rabid wolf and was given a diseased pelt and a rabid wolf hide. i know what to do with the pelt but what do i do with the hide? for bard Wind Spirits armor too. I got a coyote skull for killing a rabid wolf. Anybody got any idea what these are for. I asked a few people and nobody else knew. I got two of them. Anyone know what they're for? Coyote skulls are used in the Rainkeeper armor quest. It is a Karana pally only quest. If you cast cure disease on one of these will it turn into a normal wolf? #Anonymous, Posted: Mar 23 2001 at 8:01 PM, Rating: Sub-Default, (Expand Post) People, you have to remember that all classes are *NOT* created equal - an undead that conned black to a warrior might only con blue to a warrior of the same level. I am sorry, but you are quite mistaken. Con only compares your level and the thing you are conning. It makes no difference what class or race you are, or if you have harm touch available or not. If something is the same level as you, it will con white/black, depending on what screen mode you are in. Also some Monsters vary in level, that gnoll that was even to you 5 minutes doesn't mean EVERY gnoll is that exact same level. You will get not bad faction for killing any bears or wolves out in the Qeynos Hills. However, if you are caught by Holly Windstalker, or Cross Treewind, and you attack them at all, then someone kills them before you die or zone, you will get bad faction as having helped kill them. Now, there is a wierd thing that may be going on with the hate lists that determine the factions. When Cros Treewind comes to an animals aid, he will often heal it before blowing you to bits. I do not know if you kill the bear after he heals it, if that will consider you to have killed one of his allies, and give you bad faction. I do not know, because once he shows up, I have never continued to attack the creature I was working on, since I was too busy returning to my bind point, or running to zone. Rangers shouldn't kill wolves or bears(tough luck guys/girls) because they are outdoors man and those animals lower your faction with the wrong people. This is incorrect. While rangers do receive the benefit of not being attacked by wild animals unless they attack the animal first, there is no faction hit for a ranger who kills an animal. Warrior of the 26th season. In addition to my other post, I wish to note that I have, in the defense of others, killed animals that were otherwise amiable to me. There are no faction hits involved with killing normal wild animals. The bears in Surefall Glade, however, are associated with the factions of the rangers and druids there. It gives you negative Bloodsabre faction which makes you KOS in the bar for the gnoll teeth. Watch out about this. Unless you have invis or you are a enchanter they will attack you for doing this quest. You don't give the gnoll teeth to the man in the bar, you give them to Captain Tillen (sp) in the Arean. The moonstones are given to the bartender in The Fish ale, and that is not much xp anyway. #Anonymous, Posted: Mar 14 2000 at 1:57 PM, Rating: Sub-Default, (Expand Post) It gives you negative Bloodsabre faction which makes you KOS in the bar for the gnoll teeth. Watch out about this. Unless you have invis or you are a enchanter they will attack you for doing this quest. The same works for rabid bear pelts, only they give almost 2X the experience. On level 19, i took 4 rabid bear pelts and turned them in, it equaled nearly 1 bubble of experience!! This quest will take you from level 8 to level 14 easily and quickly. Thanks. These items are THE BEST experience for anyone under level 9. All you have to do is kill these wolves and keep their rabid pelts. Next, go to the flying saucer in N Qeynos (The Temple of Life) and find a chick named Priestess Caulria, once you give these to her, you will recieve small faction changes, LARGE amounts of experience, and she will cure any disease you have. With this quest, i was able to go from level 4 to level 9 in under 6 hours of playing! Have Fun! Does killing a rabid wolf negatively affect a rangers faction with his guild? No, there are no faction hits involved with killing wolves.